It’s important to note that the different parts of the plant are going to be at different temperatures. You’ll see this once you start using your IR thermometer. This all sounds wonderful, until you’re doing it daily, multiple times per day… and then there’s the dark period! How do you do that too!? Well, DimLux has you covered with the Maxi Controller, which can automate the measurement process for you when it has a thermometer, humidity meter, and Plant Temperature Camera. In fact, the Maxi Controller Data Logger will keep track of all of this for you on a spreadsheet so you can see if you’re having swings in your VPD when you’re not around to catch the problem! We highly recommend the Maxi Controller Data Logger with all the add ons, obviously. Plants can grow within a wide Leaf VPD range, somewhere between 0.4 and 1.6 kPa. The ideal level of VPD changes during a plants life cycle. Clones need a super low VPD to grow roots, otherwise they’ll just dry up and die. Large plants in late flowering, tend to produce much better harvests when the VPD is on the high end of the range, stressing them a bit. Also, a slightly drier atmosphere will inhibit powdery mildew and mold. Assuming leaf temperature 5° F (2.8° C) below room temp. 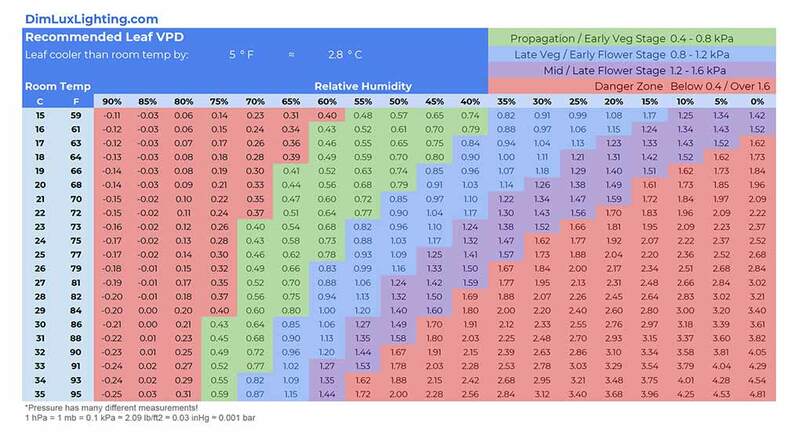 Here are the Leaf Vapor Pressure Deficit numbers we recommend over the plant’s life cycle. Keep in mind, different strains are going to be a little different than one another. Also, you need to make sure your instruments are calibrated and giving you accurate readings. If you can’t trust your instruments, then the VPD number you calculate is useless. We’ll leave you with the biggest set of VPD charts we know of, so you can just take the measurements and reference the correct color coded VPD Chart adjusted for leaf temperature. These will help guide you to maintain the best humidity and temperature levels in your grow room for each stage the plants are in. You can select the chart corresponding to the temperature the leaf is below room temperature, anywhere from 0° to 5° F. Move the mouse over the temperatures below each chart and notice how much the chart changes based on a few degrees change in the plant’s temperature. Submit your email address and we’ll send them to you right away. There are several ways to calculate VPD, but the specific formulas are beyond the scope of this article. Especially since we made that really nice leaf VPD calculator and the LVPD Charts for you. If you reeeaaaaalllllyyy want those formulas, check the source links we provide at the bottom of our post. A few of the formulas you can just plug right into a spreadsheet like Google Sheets or Excel. Why do I see VPD represented by all sorts of different measurements?! Because VPD is by definition a measurement of pressure, there are several numbers that represent it. The most popular is Pascals (Pa), which is usually too large of a number so we take it down to kiloPascals (kPa). For completeness, 100 Pa = 1 hPa = 0.1 kPa. Moreover, 1 hectoPascal (hPa) is equivalent to 1 millibar (mb). Why the different names? Well, the name was changed to honor the scientist that discovered it. We do the same thing with Volts, Amperes, Ohms, Watts, Joules, Hertz, Celsius, and Fahrenheit. Sometimes pressure is measured in pounds per square foot, or kilos per square meter. But in our case we’re going with kiloPascals (hPa) because it will give us clean whole numbers to work with that match the Maxi Controller. The Weather Window – Hectopascals & Millibars are they different?